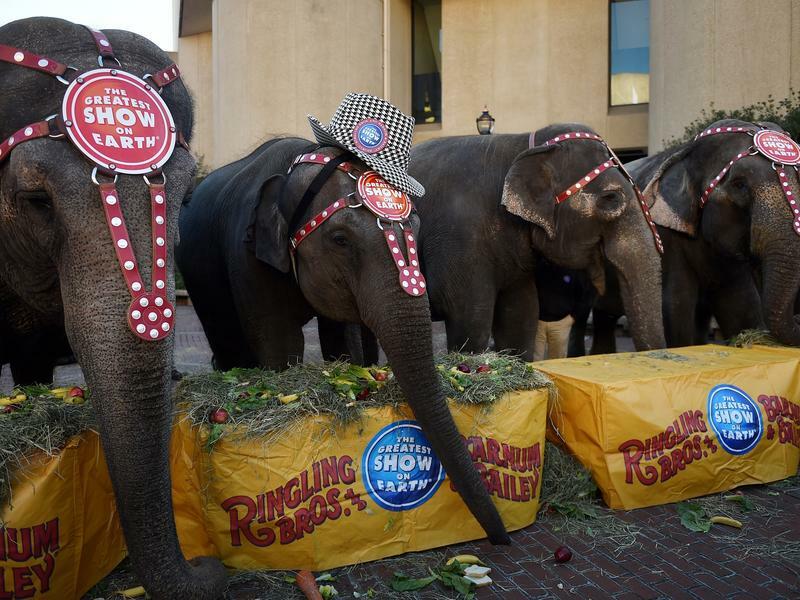 Ringling Brothers Phasing Out Elephant Acts: What Would P.T. Barnum Think? Jumbo being fed by his keeper, Matthew Scott. The two were so inseparable that Scott moved to the United States with the elephant when Barnum purchased Jumbo from the London Zoo. "I love animals too well to harm them." The Ringling Bros. and Barnum & Bailey Circus has announced that it will phase out its elephant acts by 2018. The circus’s parent company, Feld Entertainment, has cited “growing public concern about how the animals are treated” as the impetus for the decision. Elephants have been used in the circus for over a century, and have become iconic since P.T. Barnum purchased Jumbo in 1882 for $10,000 from the London Zoo. And yet, Kathy Maher, Executive Director of the Barnum Museum in Bridgeport, Connecticut, said Barnum would have applauded the decision. A Connecticut native, Barnum was born in Bethel. One of the state's most famous residents, he owned a newspaper, served on the legislature, and eventually served as Mayor of Bridgeport. “Barnum was a master of changing things up constantly. He reinvented and reinvented and reinvented. Historically, to change things up is exactly what he would have done,” Maher told WNPR. Barnum’s constant reinvention and response to public opinion and emotion was the very quality that made him one of America’s most successful entrepreneurs. At the time that he added Jumbo, the largest elephant in captivity, much less was known about the science and care of animals. As the creator of the American Museum in New York and the world’s first aquarium, Barnum was a passionate animal lover. Barnum’s introduction of exotic animals to the American consciousness led to further scientific inquiry and study, Maher said. “Nothing exists in a vacuum. As entertainments became more popular, the sciences rose too,” she said. Barnum himself grappled with issues of animal care throughout his life. He wrote, “I love animals too well to harm them.” As issues with animals and animal treatment rose in the American public consciousness, he became friends with Henry Bergh, the founder of the ASPCA. Barnum’s will left thousands of dollars to the ASPCA, and had a statue of Bergh erected in Bridgeport. Knowing what we now know about animal cruelty and care, Maher believes that Barnum would have agreed with the decision to phase out the current elephant act. “It’s easy to point the finger at him, but he was concerned with these issues. He thought: if we’re going to do this, let’s do this right,” she said. A circus without elephants? 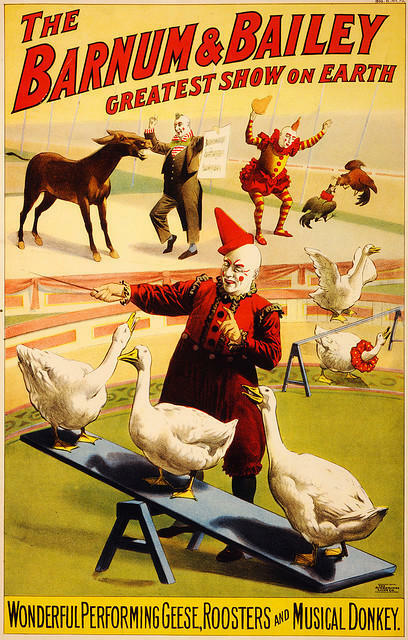 It might look something like this 1900 poster of geese, roosters, clowns, and a musical donkey. But as Feld Entertainment has recognized, there may be no way to do the elephant act right any more. Concerns about the treatment of The Ringling Bros. circus animals has risen dramatically over the past few years: a growing list of issues included the death of a tiger and two elephants. After a USDA investigation, the company paid a record $270,000 in fines for animal treatment. "We're always changing and we're always learning," said Kenneth Feld in a trial regarding animal abuse in 2009. The elephants will be moved to the company’s Center for Elephant Conservation in Florida. Currently, 29 elephants reside in the 200-acre wilderness. The 14 performing animals will arrive over the next few years as they retire from the circus. The Center for Elephant Conservation’s website states that it is “dedicated to the conservation, breeding, and understanding of these amazing animals.” Perhaps the Center for Elephant Conservation can become a safer and more humane way for families to experience the animals that have been the symbol of the circus for over a century. For more information on P.T. Barnum and circus history, visit the Barnum Museum in Bridgeport, Connecticut. There will be a lecture on Jumbo by Dr. Andrew McClellan of Tufts University on April 19th at 2:00 pm. Julia Pistell is an intern at WNPR. A Cornwall farm operator, accused of mistreating dairy goats, has been arrested on animal cruelty charges. Tara Bryson, who operates Butterfield Farm Co. with her boyfriend, Michael Hearl, was arrested Thursday. 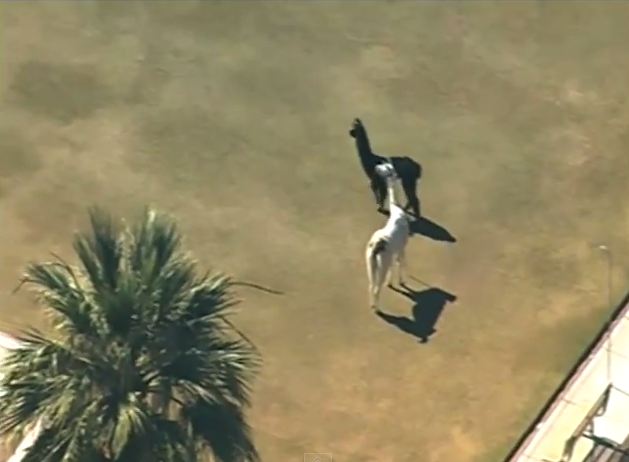 A pair of llamas on the loose in Sun City, Ariz., riveted the nation this afternoon. What's the "Greatest Show On Earth" without elephants? Starting in 2018, anyone attending the iconic Ringling Bros. and Barnum & Bailey Circus act will find out. Citing public concern about the elephants and how they are treated, the circus' parent company, Feld Entertainment, announced today that it would phase out use of the animals in its shows within three years. Good morning, I'm David Greene.